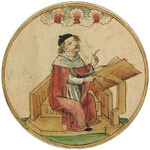 Calculations at a crescent, which is formed by two equal sized circles, one cutting out the other. 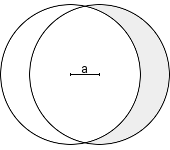 The intersection of both circles is a pointed oval. For crescents from two different sized circles, see lune. Enter circle radius and the distance of the two circle centers. Choose the number of decimal places, then click Calculate. The distance must be smaller than twice the circle radius. 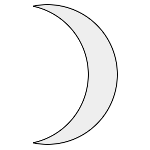 Construction of a crescent from two equal sized circles. Radius, distance, diameter and perimeter have the same unit (e.g. meter), the area has this unit squared (e.g. square meter).